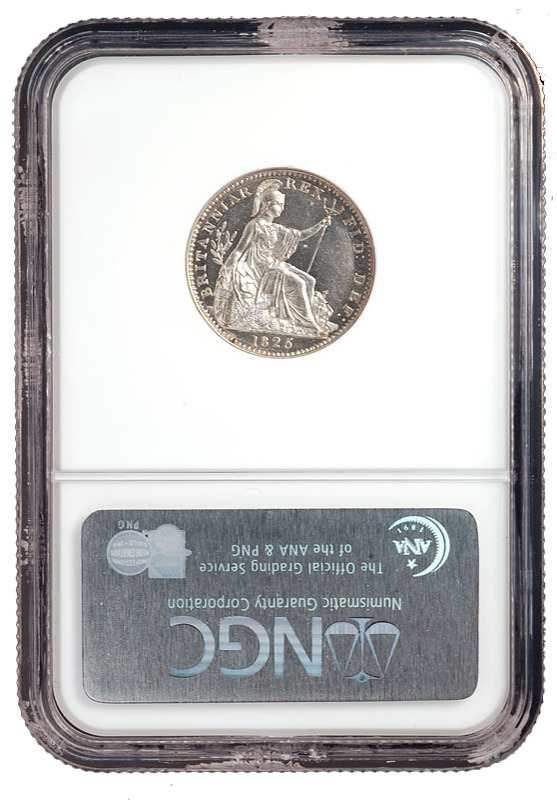 This highly unusual pattern coin dates from the late 1820’s, when the British Royal Mint was exploring the use of platinum for coinage. The hardness of the metal proved difficult for striking, and thus some details are not full struck up. This is most apparent on the obverse legend, which shows some softness. 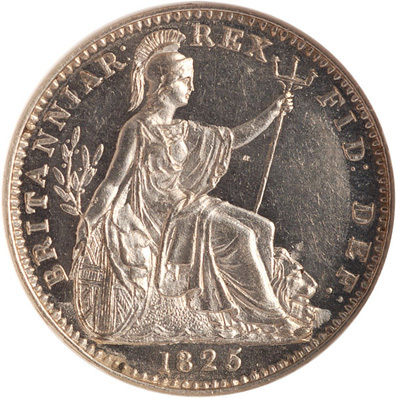 Whether because of the technical challenges or some other reason, no platinum was used for coinage in Great Britain until 2007, when it was introduced as part of the Britannia bullion series. Adding to the interest of this pattern is the unusual selection of dies. No dies were made especially for its production; instead two expired or discarded dies were chosen, perhaps because there were concerns that the hardness of platinum could cause a die to break or splinter during striking. 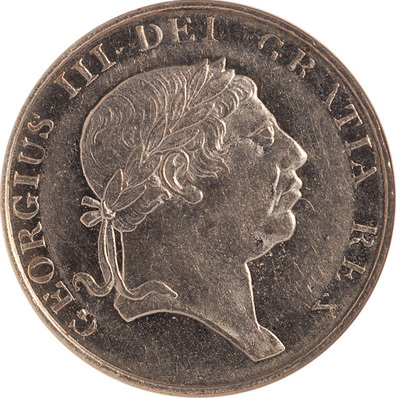 The obverse die belongs to the 1812 Pattern 9 Pence Bank Token (S3773A), and the reverse is from an 1825 Farthing. A coin struck from obverse and reverse dies intended for different coins is called a mule. Incorrect pairings of this type can occur as error coins, in the case of the widely publicized States Quarter/Sacagawea Dollar mule, or as pattern coins, as in the case of the 1860 Transitional Half Dime, J-267. 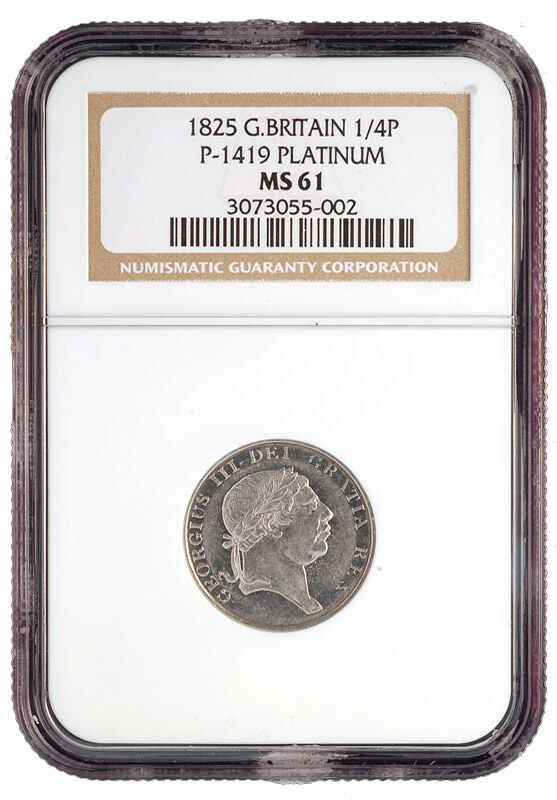 This example is one of just a few known, and it has been assigned its catalog number P-1419, from English Copper, Tin and Bronze Coins by C. W. Peck. It was graded MS-61 by NGC.